Ronstan series 40 all purpose pulleys are a great choice for any application where high static or dynamic loads require a low friction, long lasting solution. Available in single, double and triple with multiple format heads and beckets. SKU: RF41100. Categories: Blocks & Pulleys, All Purpose, Series 40. All Purpose Heavy Duty Pulley is designed for any application where high load capacity and low friction are needed. 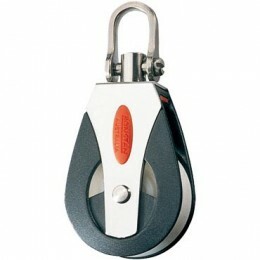 This pulley can be found in a number of different applications. reliability and longevity are needed. Removable becket pins allow lines to be spliced prior to fitting and are locked into position without the use of split rings or tools. All metal hardware on this block is corrosion resistant 316 stainless steel.